The holy grail of stem cell technologies is replacing damaged cells with functional cells. Skin and bone marrow stem cell transplantation has been successfully used for decades, saving millions of lives. More recently stem cell transplantations for blindness and tendon repair have made it to the market. While pluripotent stem cells hold enormous potential for regenerative medicine, ethical, immune and safety issues have severely stunted the field. 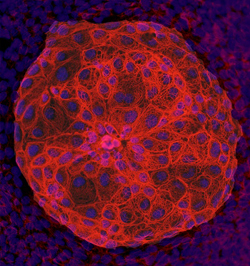 The recent Nobel Prize winning creation of induced pluripotent stem cells has alleviated both the ethical and immune issues of embryonic stem cells and are already being used in the lab for disease modelling and personalised therapies, though safety concerns of transplanting pluripotent cells still exist. Recent advances uncovering ‘non-integrative’ roles for stem cells has seen an explosion in adult stem cell clinical trials using cells from patient bone marrow and fat to treat a broad range of conditions including Crohn’s Disease, Diabetes and Cerebral Palsy. With often surprising levels of efficacy in the absence of a clear mechanism of action it is thought that these cells act as potent immune and inflammatory regulators to minimise damage, offering hope for disease as diverse as Multiple Schlerosis, Arthritis and Chronic Obstructive Pulmonary Disease. With Australia being the birthplace of several successful stem cell companies including Mesoblast, the largest stem cell company in the world, Genea Biocells, Orthocell, EcoQuest and Regeneus, we are known for our high standards on safety and efficacy. Further, with a relatively stable economy, we have a unique position to become industry leaders if we can win back the support of the public and investors who have lost faith due to the unrealised ‘stem cell hype’. In the 15 years since human embryonic stem cell derivation in 1998, stem cell sources and applications have expanded into areas the stem cell hype never could have predicted. To move stem cell technologies forward in Australia and keep us at the forefront of therapeutic advance, a collaborative industry effort is required to ensure we address community concerns while ensuring scientific advance and safety. On 29 November 2013, the New South Wales Stem Cell Network will be hosting its 19th Workshop towards a national strategy for advancing the Australian stem cell industry towards greater commercial and clinical successes. Entitled ‘Innovating the Marketplace with Stem Cells’, the workshop will bring together industry leaders in all facets of research translation including basic research and biotech to consider commercialisation and clinical application of stem cell technologies in Australia. The full day program will discuss the past and current climate of stem cells in Australia including successful Australian companies and current innovative research. What have we tried? What has failed and what has succeeded?